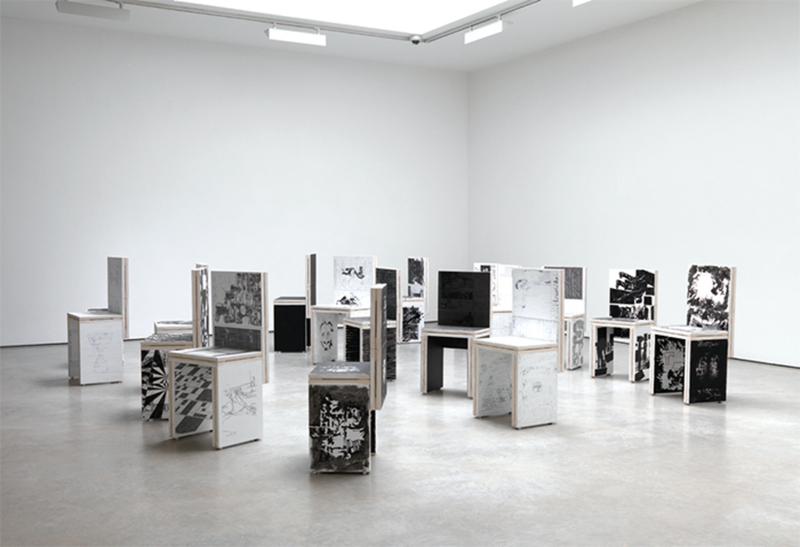 Art & Language, Nobody Spoke, 2013–14, seventeen chairs, alogram on canvas over plywood with acrylic and mixed media, dimensions variable. The English Conceptual artists Art & Language have been art-world irritants since 1968, fiercely witty agents provocateurs determined to debunk modernist assumptions about authenticity, authorship, and language through publications, drawings, paintings, and performances. Although many people have participated in Art & Language at one time or another, today the group is mainly a collaboration between Michael Baldwin and Mel Ramsden. This show included the group’s familiar mix of mediums, from large-scale abstract paintings to sculptural installations and performance, to present a provocative and engaging dissection of the perennial art-historical problem of description, highlighting the pleasures and limits of applying words to things.